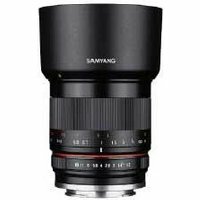 With a bright f1.2 aperture, the manual focus Samyang 35mm F1.2 ED AS UMC Lens produces brilliant low-light results. Designed to deliver high resolution from the centre to the corners of images, this Canon M-Mount fit lens is constructed of 9 elements in 7 groups, with 2 aspherical lenses to prevent aberrations. The versatile 35mm focal length is suitable of a variety of photographic applications.